The new comic is 芋虫 [Imomushi - The Caterpillar], which will be an adaptation of the 1929 Edogawa Rampo short story of the same name. The Caterpillar is a haunting psychosexual tale of Lt. Sunaga, a disfigured and limbless veteran of WWI who returns home to his young and beautiful wife. 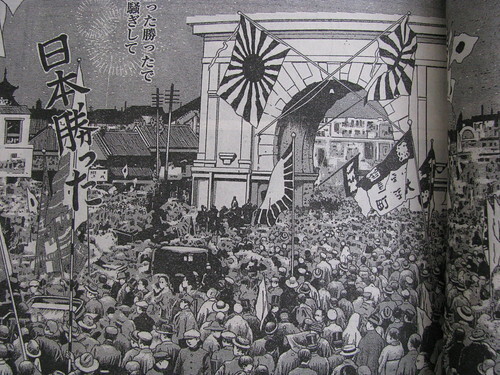 Sunaga initially is given a hero's welcome, but is quickly forgotten and shunned because of his injuries. Unable to speak or care for himself, he is completely at the mercy of his wife as she grows to loathe and toy with him. There's more, but I'll leave it there for now. I hadn't realized how thick each issue of COMIC BEAM is... The cover and spine are a thick matte with gorgeous color art. 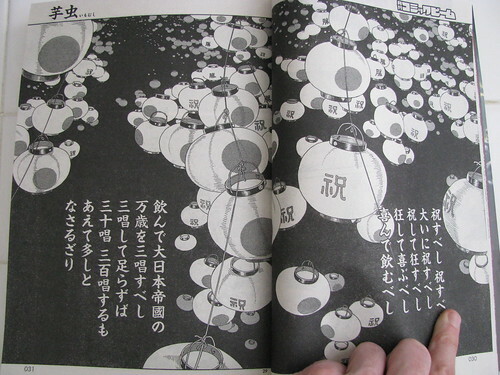 Similar to Panorama-tou Kidan, Imomushi features a lush color two-page opening with a quote from Edogawa Rampo. 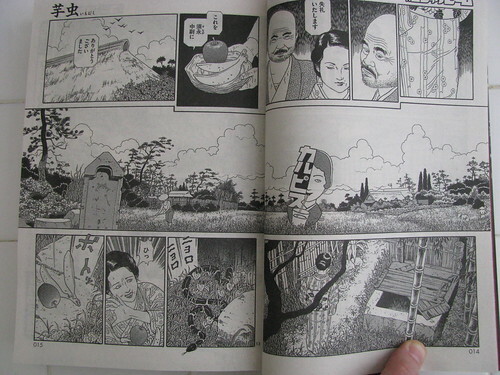 The comic starts slowly, with subtle depictions of rural life of 1920s Japan. I was surprised that we see Lt. Sunaga depicted so quickly. As folks that have read the original short story remember, he can only communicate by blinking or writing with a pencil in his mouth. Look at those outdoor details! Halfway through the chapter, Maruo jumps back to immediately after Lt. Sunaga's maining in the war. SO CREEPY! The panel and formal experimentation stuff in these Rampo adaptations are so exciting and refreshing to see. 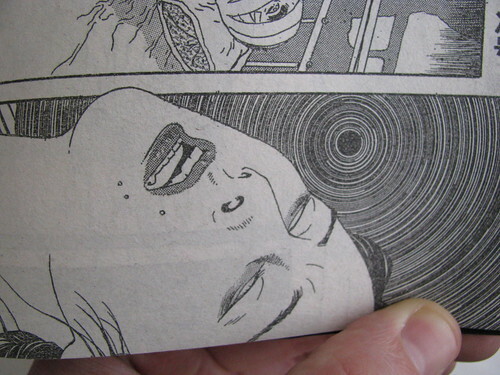 The last panel from chapter 1, a stunning depiction of Tokiko's laying eyes on her deformed husband for the first time. Looks great! Can't wait to get this for my collection. I really enjoyed this story. Maruo has always been good at blurring the line between nationalistic glory and the grotesque, and with some of the spreads here he's outdone even himself at it. Wow. 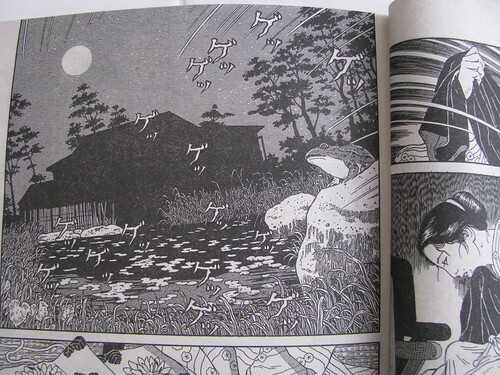 Words can't even describe how gorgeous Maruo's artwork is. I mean, he's always been impressive but his recent works (ie. this and Panorama Island)are beyond great. Someone NEEDS to licence these for release in English speaking countries... come on, seriously now! @jimpac: The panel and layout stuff he is doing is extremely elegant. I especially love the last half of the first chapter. As for the rest of what you wrote: Interesting thoughts. Man, that looks incredible. Also, I need to emphasize what a cool name for an anthology COMIC BEAM is. If people wanna go that route, it's easy to find. I won't be hosting or scanning raws here-- and I will say that I strongly hope that folks don't scanlate the new Maruo projects. We never did anything longer than a short story, and going after such "accessible" (to US publishers) stuff is whack IMHO. Maruo is still one of the best out there!This is a remarkable proof! Nice the color pages! thx for the showing this! I think he is drawing better and having a bit more of stoytelling!! well hope to have this short story one day!! saludos as always from argentina!! i finally bought and read this yesterday! so great, since the new issue comes out today. no need to wait for the next chapter! @baka: Are you going to keep the horrorbaby? @azraelito: I really like this style and setup he has matured into. I'd love if he keeps on like this with the Maruo estate! @Paperdoll: Happy to be of service... I just saw that the "Rampo Reader" was released at the end of 2008? It features previously unavailable (in English) stories and critical essays. @monika: Oh nice, lucky you! I'm getting it through Kinokuniya in SF, so it has to come over on the boat. I think it should be hear for me like July 9 or something...? I wonder how many chapters this one will run? Maruo's had Rampo on the brain forever, so glad he can finally do it up properly. I wonder how the Panorama Island and Caterpillar projects got started? Who contacted who, etc? 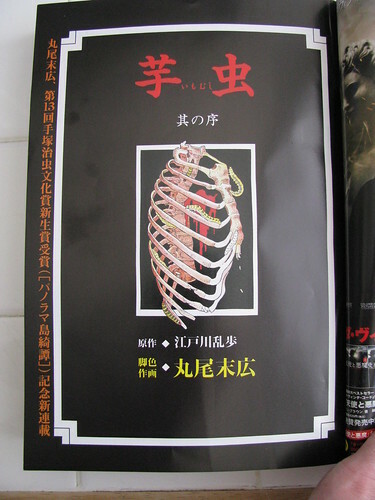 Suehiro's work is so hauntingly dark, and complex. I can't wait to take a gander at this one. He really understands how to make the truly hideous and ugly into a beautiufl work of art.